It was a beautiful day for a river float. Hot, sunny, slight breeze, and the Red Cedar River was finally back to normal/safe levels after a raining June. 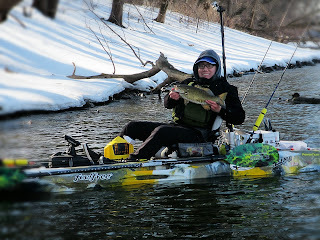 Our friend and other Small Craft Outfitters Guide, Chang Lor of www.cxfishing.com, planned a fishing float. My wife opted to come along, looking to get a relaxing day sans children (they were beachin' with my parents for the weekend). The night before we prepared the coolers, food (Chang and I eat a lot better when the wife comes and makes good food), water, etc. The fleet of Feelfree Lures for Chang and I (and a Feelfree Moken for the wife) are on the trailer. Rods are prepared with river tackle, and our Bending Branches paddles are at the ready in the back of the Jeep. 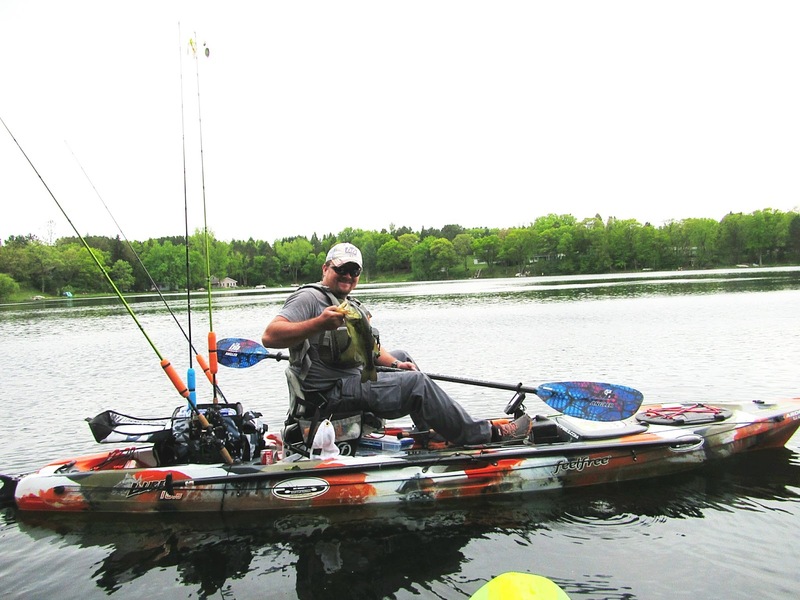 Kayak anglers and gear are impatiently waiting for the next day. Morning arrives, we enthusiastically hook up the trailer, jump in the Jeep, and head towards the meet spot while sucking down some caffeine. My wife stands back as Chang and I go through the familiar unload/rig ritual performed dozens of times this year. When finished, she stays with the gear while we drop the Jeep and trailer at the takeout. A short time later we are floating. We take our time, stopping at sandbars for food and to cool off. It is a beautiful day, so the fishing is slow. But we all manage to land a fish or two. I was proud because my wife caught her first walleye on a PowerTeam Lures 4.5" Grub soaked in JBs Fishsauce! She even handled the fish by herself and gave it a safe release. We get near the end of the float in this beautiful area of the river. To the left is a steep sand bank 100'+ tall. On the right bars of smooth river rock and sand. We stop to enjoy the scenery, chat to some canoe anglers about our kayaks, then sit and chat. I am not a religious person, but believe everything happens for a reason. For some reason Chang, Stacy, and I just sat there chatting about random things. I don't know why. Maybe it was because we were (finally) on no time crunch. Maybe it was the beautiful day or the beauty of this sandy s-curve area. Maybe it was to be there for what happened next. 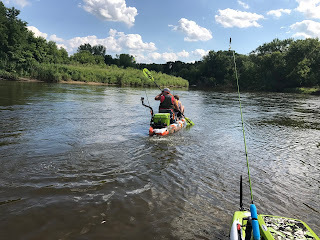 After talking for a while, we seen a group of river tubers come around the corner and hang up on one of the branches on the opposite side of the river. We had passed several tubers who were enjoying this nice day earlier. We continued talking and noticed them stop in an odd spot in the swift current opposite us. A hazardous piece of the river that claimed a new pole of Chang's (and nearly me) last year. We assumed it was some people messing around. A short time later, Stacy said, "I think those people need help.". I look over and there is a couple down the sandbar about 20 yards running for their canoe, they are going to go help the tubers calling out in distress. 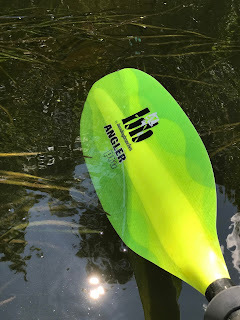 Knowing the canoe will be difficult to hold in the dangerous current, I jump in my wife's Feelfree Moken and grab my Bending Branches Angler Pro paddle. The Moken is narrower than my Lure and much easier to paddle. It was my best chance of getting to these people and staying there if required. Paddling vigorously, but calmly, towards the tubers I call out to ask if they are OK. I can't tell by the scene. They cannot hear me over the sounds of the river surrounding them. Paddling closer I can see they are indeed in need. I get closer to assess the situation. It is a family of 5. Two children, girls, about 12 and 15 years of age. The older of the two is in the water, her grandfather holding her up against the current. She was being pulled hard by the current and had ran into a rock or stump when she came off her tube. Her tube is now deflated, caught on a stump just under the water. Their tubes are tied together so the entire group is being held in the strong current with no escape and no life jackets. 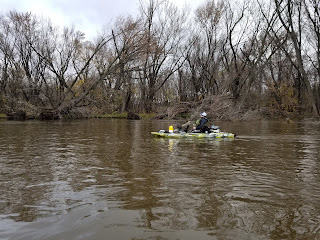 While I'm assessing the situation, Chang was paddling his Feelfree Lure upstream, a difficult task in this fast current. I call out to him and Stacy, who is watching the situation unfold from the bank, calling out any problems she can see. I tell her to grab the spare life jacket we keep in one of the Lures and toss it to me. Chang is able to strong-arm his way upstream and toss the life jacket to me as the current sweeps him away. Handing the life jacket to the girl in the water, I tell her to put it on. She puts it on backwards, the only way she can right now. But it will do. I try to free the tube from the stump but the current is too strong. I'm holding onto the grandfathers tube while trying to pull on the snagged one. I'm taking water over the side of my kayak. The force of 5 people pulling on it via the current is too strong to free it. The girl with the life jacket had bumped into something hard under water during the incident and was starting to panic about hitting something else if we freed them. In an attempt to calm her down, I told her it was my only option and they would be pushed downstream to the corner where Chang and the couple in the Canoe were waiting to catch someone if needed. She was still panicking about hitting something, so I told her to pick up her legs. The water was deep her and that would keep her safe. I knew in my mind a bump, bruise, laceration, or break was better than drowning. And the party was only going to be able to hold onto her in this strong current for so long. 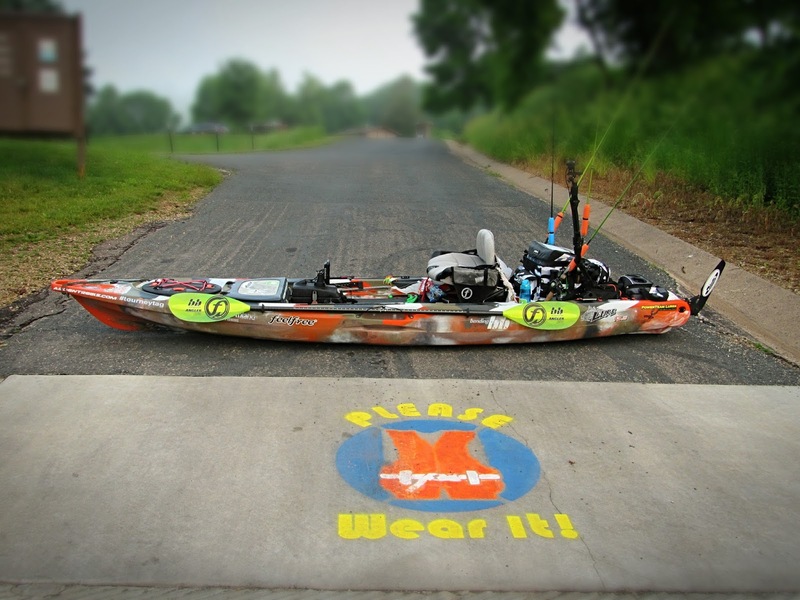 In addition to extra PFDs, we always carry extra safety gear on our kayaks. Chang, Stacy, and I are all CPR/FirstAid certified. I am also training to be an EMT. We each have a Stohlquist SqueezeLock knife on the rail of our kayaks (Chang found out the sheath for them snaps perfectly into the Feelfree track so it is handy). We also carry CPR masks, first aid kits, a Stohlquist throw bag, and other survival gear. Today I'm glad we do. The nylon ropes connecting the snagged tube to the rest of the group are openly exposed. I can safely cut them without risking injury to the family. I pull the blade out of the sheath and cut the first rope. There is a brief jolt. Before any nerves can set in with the family, I cut the second rope and they float free down current. Looking back, I see Chang and the couple in the canoe on the corner ready to catch them. 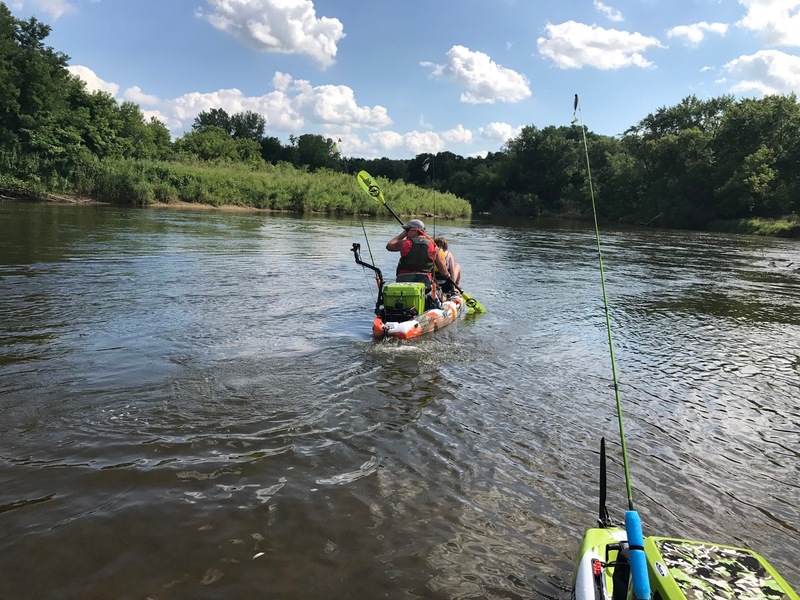 Since I'm already upstream, I pull the limp tube off the stump and throw it on the deck of the kayak before turning around to check on the family. At the corner, they are hanging onto the front of Chang's Lure. He is back paddling, but 5 people against the current is abating his progress. The couple in the canoe had thrown a life jacket to the other young girl in the group just in case she were to fall out. As I was trying to figure out how to get these people to shore, one of the girls is able to touch bottom and walk. 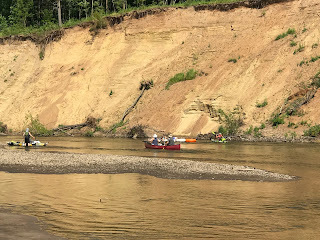 I slide over the rail of the kayak and walk to them, grabbing the tubers, allowing Chang to reduce his paddling efforts. I suggest the family come to the sandbar so we can check them out and let them collect themselves (and honestly me too because my adrenaline was on fire in my veins). They thanked us profusely and insisted they were fine. But they were now short one tube. I suggested the girl most shooken up (the one stuck in the water) ride on the front of my Lure. I explained the river was too dangerous to go without a craft. Sharp rocks, holes, undercurrents awaited them on the brief float to the takeout. She needed to be out of the water, especially shooken up and possibly injured. The family agreed she should ride with me, I assured them my kayak had room and was plenty stable. I had her get in the Moken as I pulled her along the shore back to my kayak where Stacy was waiting. I got my tackle cleared off the deck area and had her sit on the front cooler on my Lure 13.5. She tightened the life jacket and we pushed off. Chang and Stacy were going to gather their things and follow behind. I wanted to catch the rest of her family who were floating down river. Unsure of their current state given adrenaline and fighting the current, I pulled my throw back from under the seat. The girl and I rescued their cooler lid before reaching her family who were immediately concerned, asking where she got hit under water and if it still hurt. Luckily it didn't and she was fine. I tossed the family the throw bag and tied my end to the handle on my Lure. The current by the takeout can be tricky, so I want to keep the family retrievable just in case. Glad I did. We did some chatting with the family on the short float to the takeout. Talked about me training to be an EMT, owning a kayak fishing business, being a guide, etc. 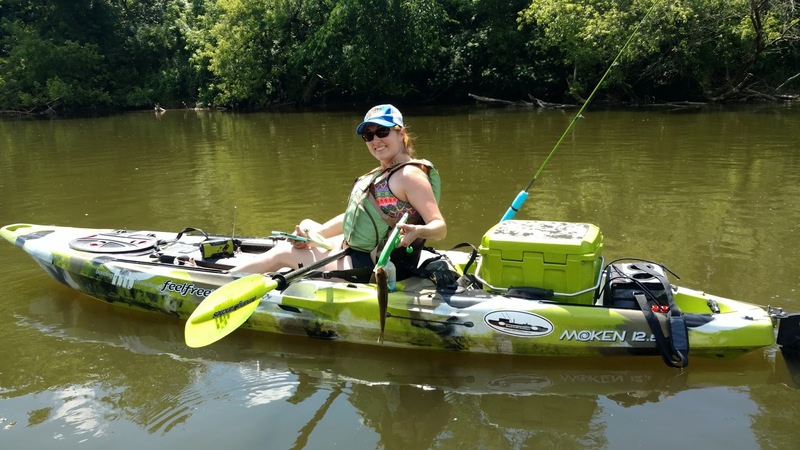 The girl riding on my kayak is interested in going into medicine and asked a few questions. The grandfather asked what I recommend for safety on the river. I told them I always wear my life jacket. And anyone that comes on trips with us is required to wear one. Even the strongest swimmers are no match for Mother Nature. I don't give people a hard time that don't choose to wear them, but if you are with us we require them (for safety AND insurance reasons). We also have straight blades on us. Which, I explained, is what I used to free them. These are the minimum items I recommend on the river. I told them even if they don't wear it, they should have life jackets with them in case this happens. A river, no matter how shallow or visibly slow, can turn on you quickly. They change constantly. You never know what will happen. As we near the launch, we have another situation. The difficult current by the takeout takes them to the opposite side of a small island than I. 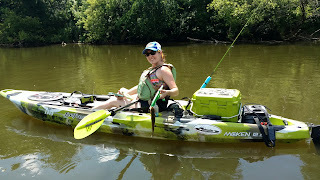 With some brute force, I was able to verify my kayak was securely tied to the throw bag line, get out, instruct the girl to stay on my kayak, and pull the other family members back around by my kayak. One of the family members was able to get out and help. The rocks here were shallow and jagged. He suggested he walk back to the takeout, but I advised against it. At this point Stacy and Chang had passed us and landed, ready to catch the family as we came around the corner. They had sandals on and were able to safely walk on the jagged rocks. The landing was mostly uneventful. As Stacy called their ride back, we chatted. They thanked us profusely, and we insisted we stay with them until they had a ride to make sure they were OK (and honestly it took a while for my adrenaline to wear off). Their ride arrived shortly after. They took some business cards, thanked us again, and went on their way. These kind people send us a nice thank you card and a monetary donation. Completely unnecessary, but very much appreciated. We wanted the money to go towards further rescue efforts so it will be donated to our local EMS. I didn't write this article for attention, thanks, etc. It is in my nature to help people and react quickly, calmly. I get that from my father. I wrote this for those who say, "It won't happen to me." and "I'm a good swimmer.". Please, at least have a flotation device within your reach if you don't wear it. Get a nicer life jacket. 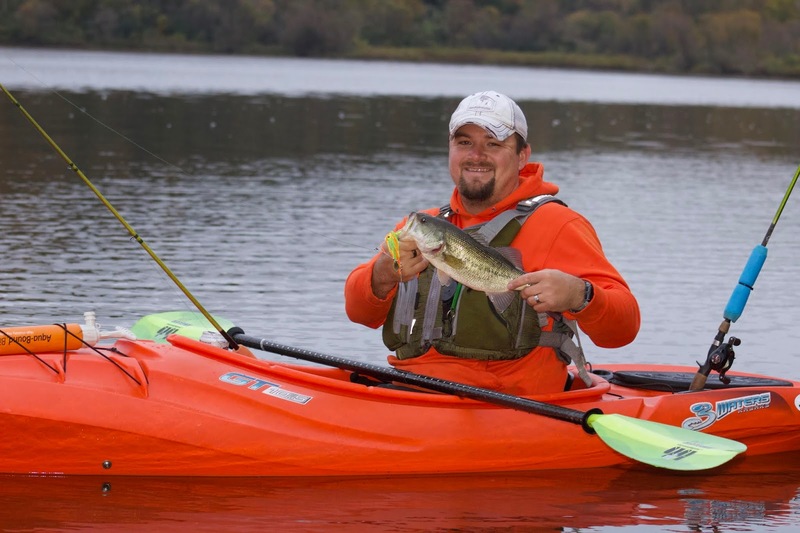 The inflatable ones and paddling-specific life vests are comfortable and easy to wear. I personally want to thank my good friend Chang Lor and my wife Stacy. They kept calm and in critical positions to make this rescue happen without further incident. 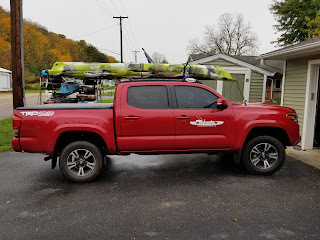 I want to thank Feelfree Kayaks for their ultra-stable platforms allowing me to paddle upstream then carry someone downstream to keep them safe. 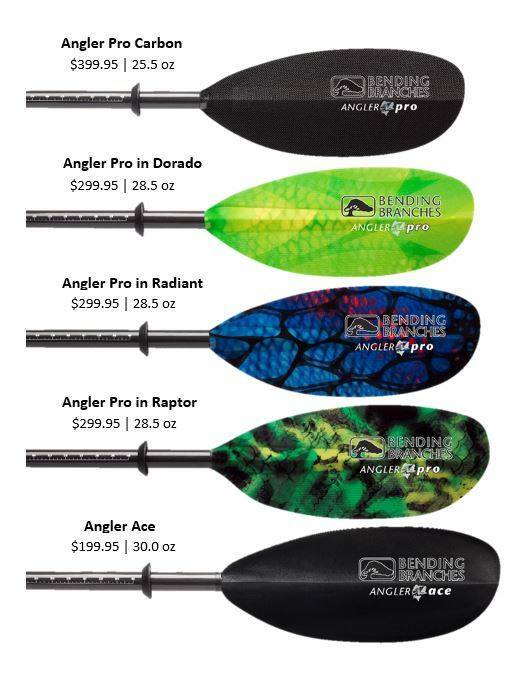 Thank you to the folks at Bending Branches for making the best paddles on earth. 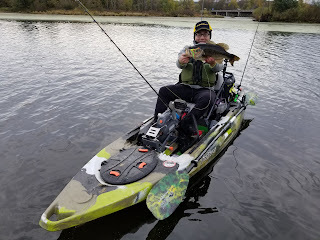 My Angler Pro paddle saved my life twice and now this family's. Thank you also to Stohlquist Waterware for making great safety gear. Chang, Stacy, and I wear their paddle specific life jackets. They are effective and comfortable. Our spare life jackets are also Stohlquist paddle specific. Their SqueezeLock knife at the ready saved the day. Ultra easy to grab, with a blunt tip for safety, and ultra sharp edges. Without the knife, this rescue may not have happened. And for their throw bag. Small, easy to deploy, and strong. It was critical in bringing the family back safely to dry land. Don't let a beautiful day with your family turn into a tragic day permanently without. When I was a kid, I remember my Great Grandpa telling me stories of fishing for Catfish and Musky on the Fox River in Illinois. Some of the bait would be frowned upon today and would cause an uprising from PETA. But in those times, it was as normal as a night crawler. He used to tell me about some of the old lures they used. Spoons and spinners. Simple, flashy, effective. To this day, though having more advanced engineering, materials, and manufacturing, just as effective. My best fish have been caught on spinners. I've always loved inline spinners. The ones my Great Grandpa told me about, and we have all seen in magazines and on the interweb, are amazing. Horse hair, a treble hook, a wire, and a hammered-out buffed piece of metal as a spoon. Sure, lure manufacturers made some. But in my Great Grandpa's youth, they didn't have the funds or supply chain to get things instantly. Some made them in their machine sheds on the farm. But they caught fish. Without titanium, electronics, power anchors, topo maps, the Internet, etc. Times change, and of course, society (and the fishing industry) changes with it. Sometimes we see throwbacks, like bucktail/horsehair jigs being homemade by MLF/Bassmaster pros. Now manufacturers are making more of those. 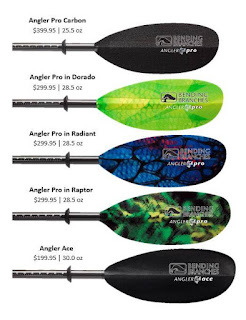 We've all used the variety of highly effective inline spinners like Mepps or Rooster Tails. But every once-in-a-while, someone takes this time-tested design and changes it just enough to make the fish curious. A hungry, curious, fish seeing an amazing action with a large profile ends up on the deck of my kayak. I'm not talking about taking a standard plug, putting a flashy pattern on it, having marketing experts put it in fancy packaging, shipping it with an elaborate display to major retailers, and slapping a $30 price tag on it. I'm talking about taking the effective design of a time-tested lure. Making it stronger. Making it present an amazing life-like action in the water, and fixing the things that make us pass over the older versions when browsing through our tackle boxes. Enter a young man, a fellow Wisconsinite, 7 years of age, who got hooked on (pun intended) making lures and catching fish at the age of 4. He comes up with this dream, now called the Lovertail 2. 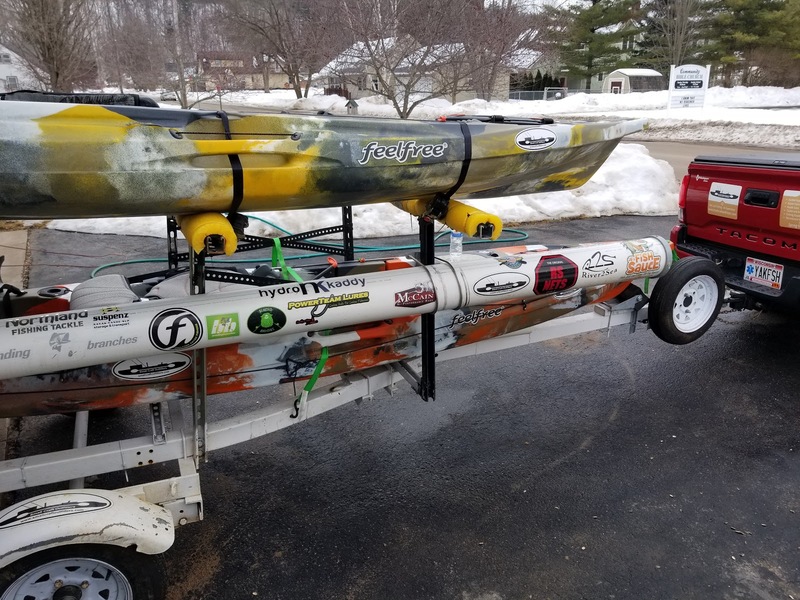 The combination of Alex's amazing sales skills (I have witnessed them first-hand), the build quality, and in-water action of the Lovertail 2 in the water make this lure a hot item. I happened to stumble across these amazing lures for the first time at a small bait shop called Bite-Me Baitshop in Mondovi, WI. The beautiful colors and high-quality components of the lure caught my eye. The owner told me Alex's story and I had to try one of each color. To say the least, I'm glad I did. I've since added several to my collection, and plan to add many more. This year I was extended the honor of being their first pro-staff member. I believed so much in their products, story, and mission that I had been previously promoting them without ask or expectation of anything in return. These are truly amazing lures. Their exploding popularity, expanding to small bait shops around the country, is a testament to that. I often wait to get their latest-and-greatest lure because they fly off the shelves so quickly! Initial glance at the Lovertail 2 and you may think its just another spinner. I assure you it isn't. These lures are hand-made by Alex, his dad, and friends/family. They have only the highest quality components. The skirts are top quality, landing me countless bass and pike with zero signs of wear. And unlike the inline spinners of old, they are weedless without affecting hookup ratio. 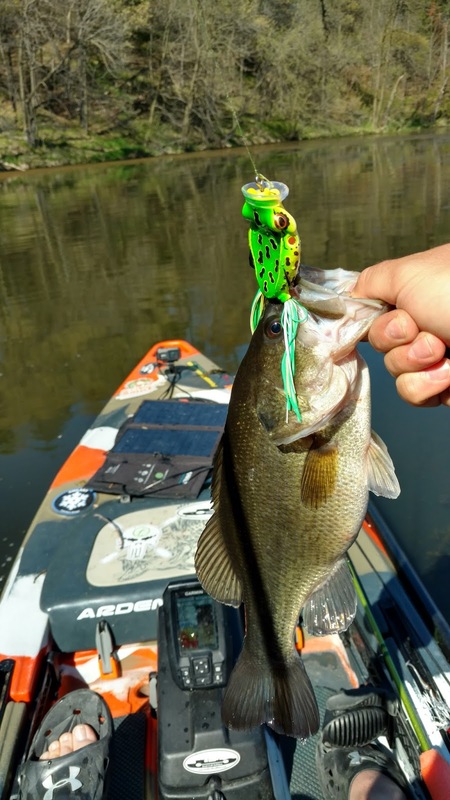 The weedless design actually adds to the action of this lure. Why do I believe in these lures so much? The photo evidence is in this article. Alex is a lure design genius with the support of an amazing family. He is doing what he loves at an early age. He creates highly effective, high-quality lures, and he and his family are some of the nicest people you ever meet. They are doin' it right. Add JBs FishSauce to their lures and you've got a deadly combination! 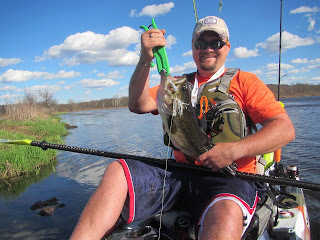 Check out James Gang Fishing Lures at http://www.jamesgangfish.com! After a rough start to the 2017 Wisconsin fishing season in Part 1 of this story, I was out to redeem myself. My good buddy Chang Lor of www.cxfishing.com suggested we start at a big lake then move to a body of water connecting two large lakes in Western Wisconsin. A bit sore from the previous day, I'm running late and tell them to launch sans me. I arrive at the launch on the big lake, go through my rigging exercise, and hit the water. Eventually I merge with my fellow yakers and we hit a small area of the water. Chang manages to haul in some bass. I'm targeting crappie once I see the size of the slabs spawning in the shallows. To make a long story short, the big crappie won't bite on anything. They have other things on their mind. I do eventually landing a few nice ones. A bit later, we try the big water, but it is fruitless. We opt to head to the smaller water. Chang tells us stories of the amazing vegetation there, making it a frog heaven. I am closer to the launch, and slower to load up than the others, so I begin the paddle in. 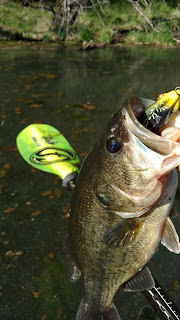 A couple dozen heads of pan fisherman in aluminum boats turn as I paddle by in awe of my Feelfree Lure. A short time later, I go through the land, load, and go process. I opt to keep it simple for the next stop using only two rods. After a short pit-stop for lunch and to fix Chang's brake light, we are at our destination. On an old gravel road in an area that could have been used to film the movie Deliverance. Nonetheless, we begin unloading whilst choking down our lunch and the clouds of dust we kicked up. We launch in a small area. The launch looks promising, a dirt launch for small craft. The swamp surrounding smells of dirty diapers left in a gym locker. Most would be repulsed and leave. We comment on the stench, but understand this means cover for fish. We go our separate ways in the open water. I'm dreaming of topwater, so I'm watching my Garmin Striker's temperature reading like a hawk looking for roadkill. It is still below 60, so I start with my search bait, a Northland Tackle Reed Runner. I manage a few weak hits, but overall am fruitless. 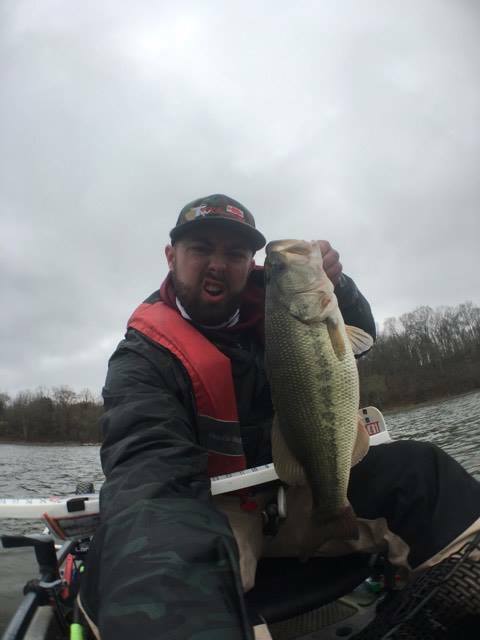 Meanwhile, one of our buddies is landing bass non-stop on a rubber worm. At a loss in this odd water, I throw on some plastics. But by this time, his plastic bite slowed and the weather is changing. Frustrated, I go for broke. My Garmin reads water temps just above 60. Good enough for me. I toss a Whopper Plopper 130 in Perch pattern alongside a few patches of floating vegetation. The water depth is about 4-5 feet, with thick vegetation below. The skies clear blue and the sun bright. Other than the less-than-ideal water temps, a recipe for topwater. Probably looked like a kid moving their controller while playing Mario Kart as I maneuvered the Whopper Plopper between the floating vegetation patches. Then it hits! First topwater of the year! Its a dink, about 12", but I celebrate as if I just got my personal best. First topwater of the year! I eagerly tie a frog on my other rod. I only brought two rods. Luckily one is my frogging rod, but I left my topwater ones in the rod tube. But I make do with my spinnerbait rod as my Plopper rod. I continue to work the area of patchy floating vegetation. I'm getting hits, but they are short and weak. I drool as the water temps continue to climb. Getting frustrated with all the short hits, I decide to venture on. My co-yakkers are long gone. I spot the Lime Camo of Chang's Feelfree Lure in the distance and head that way. While en route, I come across a small bay. The wind is blowing all the floating vegetation into the bay. I give my frog a toss, again getting short hits. Though the vegetation is helping the sun heat the water quicker than the other areas. I head across to the other shoreline to chat with my buddies. I let them know of my topwater success, they excitedly tie on topwater lures. I suggest they follow me to the bay because the water on this side of the lake is still below 60. They continue working the same shoreline, I head directly for the algae-filled bay with the determination of an Olympian on my face. I'm going to get a fish via frog before I call it a day. My efforts start slow. I miss a few big hits in the brush near the bay. Growing frustrated, I move within casting distance of the algae. A short time later, I get my first solid frog hit. But I was so excited, I set the hook too early and missed it. But alas, the next cast, I landed my first frog fish of the season! I excitedly continue tossing my River2Sea Spittin' Wa frog lathered in JBs FishSauce, trying to figure out the retrieval pattern they want today. After landing another fish shortly thereafter, I find they prefer the slow roll retrieval. I land a few more fish, but the bite suddenly stops. I need to change it up, they are onto me. I tie a Livetarget mouse onto my spinnerbait rod. I long for my backup frog rod with 50lb braid, but this will do. I land a few more fish on the mouse until it is stolen by what I assume was a large pike. 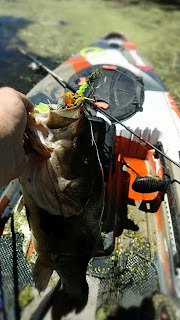 I silently curse myself for leaving my topwater rods behind and tie a smaller River2Sea frog on without the popper cup. The popper is beginning to spook them. As I finish tying on the smaller frog, I notice my Garmin reporting a water temperature of 68 degrees! Yes! I manage several more bass, a few of them respectable, all of them a blast to catch. 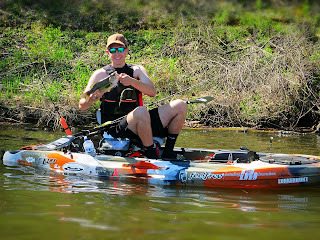 Blue skies, warm temps, floating in my kayak, catching nice fish on frogs, with the smell of muck and algae around me. I'm in my happy place. After a while, and a few more fish, I have a problem. Albeit a good one, disappointing nonetheless. After a full day fishing the day prior, a full day today with a move between, and the number of fish landed this evening, I'm exhausted. I miss several fish. I try to blame the bite, but realize it is my inability to set the hook. My hands and forearms are aching. I take a moment to look around, enjoy the beautiful day, and decide to call it a day. After taking a moment to enjoy the beautiful view of my kayak covered in algae and muck (a sign of a great day froggin'), I put away my rods, clean up my deck filled with lure candidates, lower my seat, and casually begin paddling in Chang's assumed direction. I hadn't wandered terribly far from the swampy launch, so I take my time paddling. Enjoying the the scenery of this small body of water connecting two large lakes, I appreciate the day. A beautiful day, filled with great scenery, with good friends, ends with catching fish to the point of exhaustion. This is what it is all about. Chang and I rendezvous and chat as we paddle towards the stinking swamp launch awaiting us. 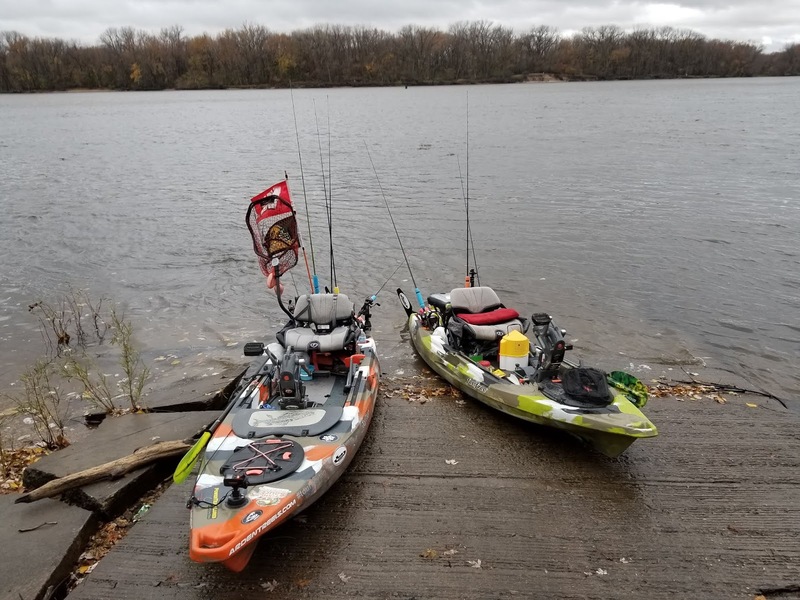 We both agree it was an amazing day on the water, no matter our level of success. It has been a long Wisconsin spring. We had a wide range of weather and temperatures. Anything from 20 degrees to 80, sunshine to snowfall. This has made the bite difficult to lock down. Early in the season the pike bite was hot on spinners during their spawn. The temps rose and I was able to boat over 40 bass and a nice 4.5lb bass in one day on PowerTeam Lures Grubs and the James Gang Fishing Lovertail2 both covered in JBs Fishsauce. The two weeks following were slow when the water temperatures dropped back into the 40s with the cold temps. 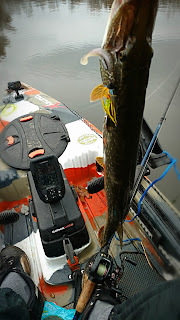 I was able to coax a few bites, but not the hot pre-spawn bite while temps were on the rise. 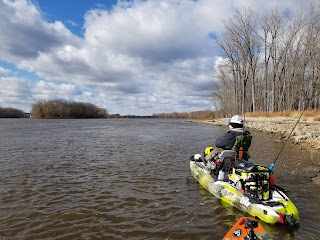 The first weekend in May, Wisconsin Fishing Opener, a sacred day to some (myself included), was no different. I'm still in winter sleep mode, my mind still sleeping late to avoid the bitter cold mornings from the Wisconsin winter. To avoid side affects (severe irritability) I ease into my summer up-and-at-em-for-fishing sleep schedule by waking up at dawn. This allows me time to get up, gather my things, get to my home reservoir, and get on the water before sunrise. This also allows me to beat most to the water. This opening morning, my brother-in-law is also joining me for his first time kayak fishing. He is now using the first boat that started my Small Craft adventures, his dad's 12 foot flat bottom jon boat with an old MinnKota. A fine fishing machine, but no Feelfree Lure. 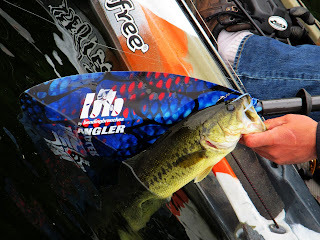 We arrive at the reservoir, unload his mighty steed, a Feelfree Lure 11.5. Instead of a MinnKota older than he, his boat will be propelled with a Bending Branches Angler Ace. An efficient, light, paddle to make his adventure easier. It also has a lure retriever built into the blade, which is a key feature for someone I've previously called "The Snagmaster". We finish our rigging and start rolling the kayaks towards the water. A short time later we are paddling towards the dam. We always target the areas accessible by larger boats first. Once they begin to flock after sunup and warmer air temperatures, we retreat to the shallows where they can't go. I watch the temperature on my Garmin Striker like a hawk, hoping for that magical number, 60. 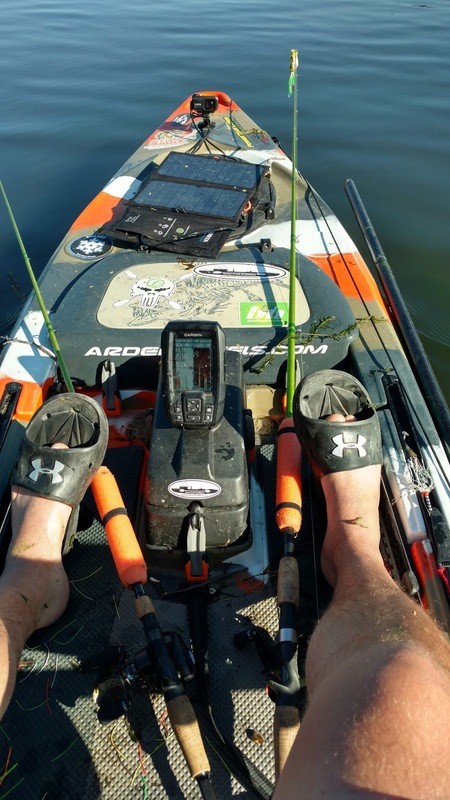 Typically topwater starts working when temps raise above that magical number. 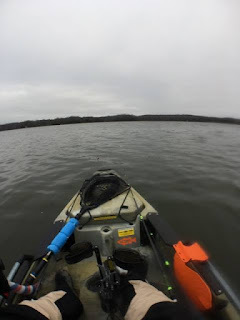 While paddling to our destination, we are spooking several panfish. Unsure of the bass bite this early in the reservoir, we brought our ultralight gear as a backup. We toss small Rooster Tails out and my brother-in-law quickly starts pulling them in. Though not massive, still fun and immediately gets the skunk off of the trip. A short time later, we carry on to our planned location. Our efforts using various spinners along the dam are futile. We opt to try the other side of the lake. The sun hits it first, and the wind is starting to pick up, perhaps the water temps and shelter from the wind will help. 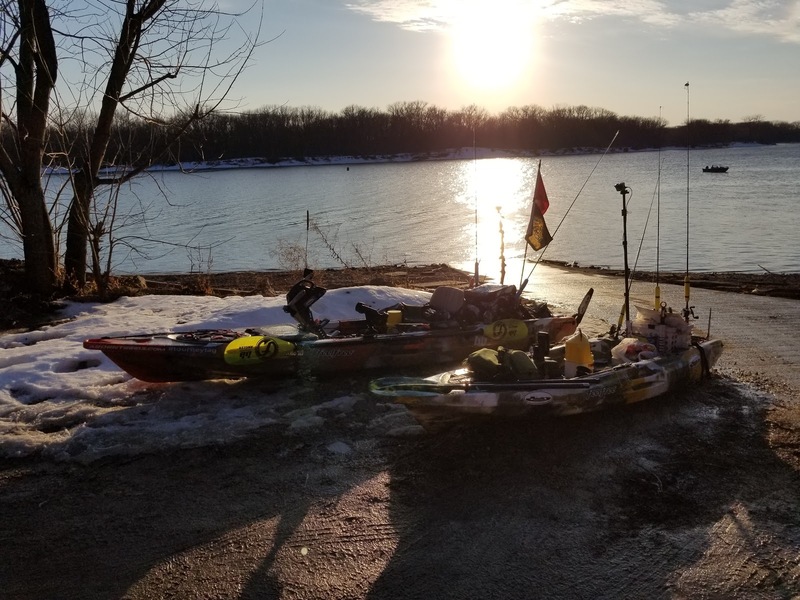 We arrive at our destination, deciding to toss the Rooster Tails again we begin hauling in several panfish, both Bluegill and Crappie. We catch two nice "eater" Bluegill and I toss them in my Lure 13.5's cooler. 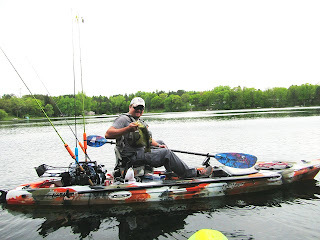 The panfish bite slowly dwindles, so we try our hand at the shallows without success. At this point, we both caught bass. The biggest approximately 4". We are glad to have been successful with panfish, but we know the caliber bass in this reservoir. We are disappointed not to have been able to snag into some, so we mix it up and move to a bay on the opposite side of the lake. At this point, it is 10 AM. The sun is up, causing us to have already shed some layers previously worn to abate the chill of 38 degree morning. To make a long story short, we were nearly skunked on good bass until my brother-in-law managed to pull out a nice largemouth. His first on a Feelfree Lure, or any kayak for that matter. His smile said it all. The stability, comfort, portability, and other features of the Lure made him like it. 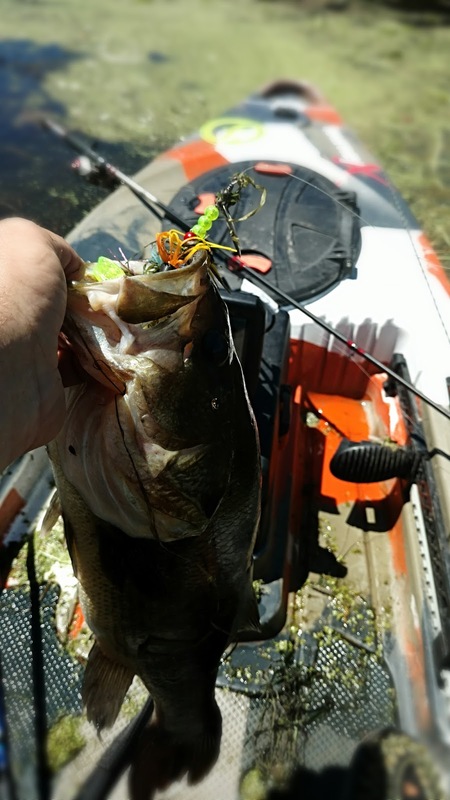 Catching a nice bass in the kayak made him fall in love. 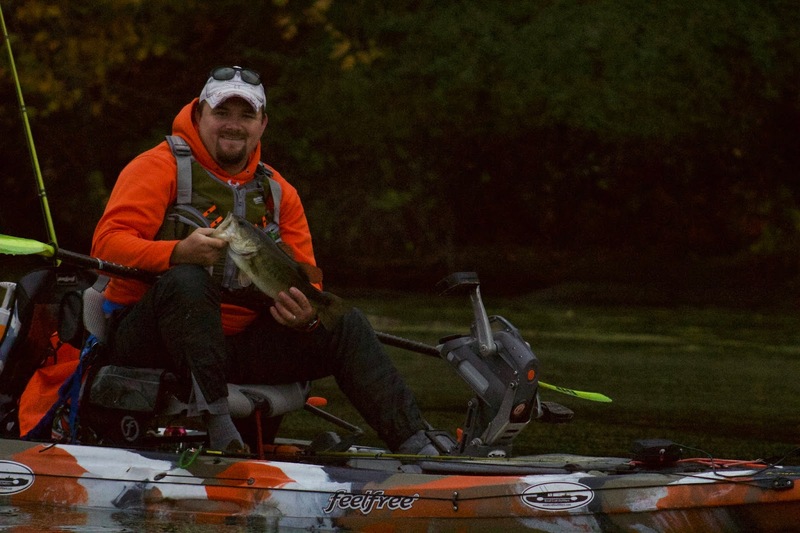 The sport of kayak fishing is exploding because of this. There is nothing like being one with the water, your gear, your "home" in the seat and on the deck of a kayak. Then you feel that first tug of a large fish. But this time it is different. This time, your vessel is smaller. It tilts ever so slightly during the bite, rocks gently during the hookset, and starts moving towards the fish during the fight. There is nothing like it, and that is why we love it. That is why I do it, why I share these experiences with you, and why I started a business to bring people this joy in the sport. Man things are finally starting to settle down again. Even though KBF NC was a few weeks ago things are just now beginning to go back to normal, just in time to pack up and head to Michigan in a couple weeks... Any ways the Kayak Bass Fishing National Championship and Open was one heck of a good time! I got to meet so many new people and hang out with some great friends from my personal club, Kayak Bass League. Plus I got to fish one of the best bass fishing lakes in the nation, Kentucky Lake. In case of the odd chance that you have never heard of Ky Lake...this place is huge. 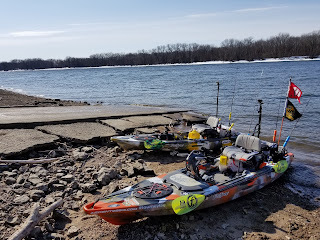 Just think to go from the North end of the lake to Paris, Tn (weigh in location) was over an hour and a half drive....definitely don't want to paddle that! I spent a whole week down there hanging with friends and of course fishing! While practice had its ups and downs, I was having a great time! Throughout the week we had rain, hail, wind and sun causing the bite to be all over the place! Going into the tournament I knew I would need to find a good area to compete with the best. This is one big lake with a lot of water to cover! Throughout practice I found many good shallow bite areas that seemed to vanish as soon as they appeared. Being a river system, I knew the bite could change quickly based upon how much current was being created by the dam, but I had no idea how to counteract that. After 4 days of finding a shallow bite and watching it disappear the next day, I went exploring. I found a ramp on my lake map while driving through the country... side note don't try it, its super unsafe but I had no cell service and was super lost... I found an area that looked good when I got there and by looked good I mean there was no one fishing it with white caps rolling straight into the cove, sounds promising right? Well I gave it the good college try, finding a fish on the three secondary points I fished. I knew I had found a diamond in the rough but I still didn't have confidence in the deep bite. Being as stubborn as I am started at my go to shallow spot to find it was dink city. I caught my limit within 30 minutes, all the fish being from 9-12.5 inches...that's not gonna win anything! I fished it hard till around 11:30 until I realized I needed to do something different. I hauled it back to the ramp and loaded faster than I had ever seen and sped off to my deep spot I had no confidence in. I rolled up and got the yak in the water to realize the wind was even worse. I pulled out my Kistler Mag 2 MH with a 1/4 oz homemade shakeyhead with a june trick worm and went to work. Right away I got on em! I was about to make a run. With only about 2 hours to fish at my new spot I culled my 40ish inch limit into 83 inches. I was on cloud 9 about day one! Plus I had finally gained some confidence in fishing deep! I started day 2 at my deep cove and immediately started on my favorite secondary point. I knew the weather was going to be windy and overcast till about 10 or 11, helping the deep bite, so I had to get to work quickly. I caught my limit within the first two hours and went to work culling. I finally started to find some nicer fish in the 18 inch range. Unfortunately I did lose a nice one, around 20 inches. As the wind died and the sun came out the deep bite died. I went searching with a jerkbait but couldn't find anything to help me. I ended day 2 with 84.75 inches. I was very happy with this, especially since I hit my area very hard on day 1. Next came the results from the weekend. While I didn't cash any checks...one position away...I was very happy with my finish. 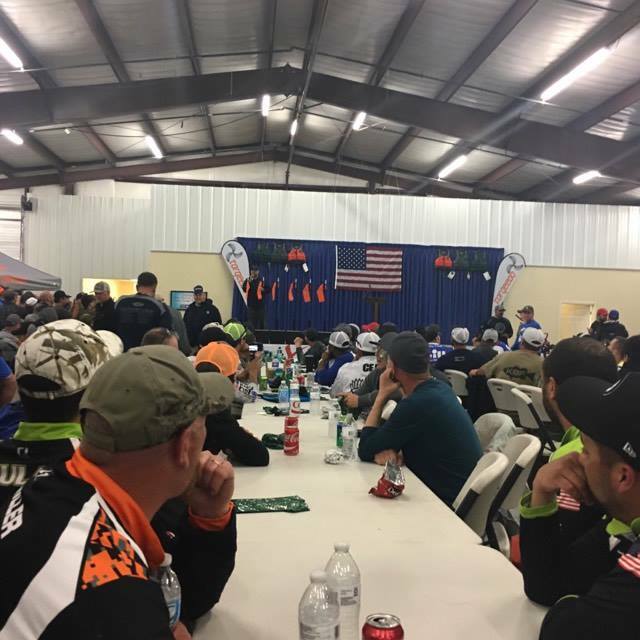 I ended the national championship in 41st out of 359 anglers and in the open I managed 34th out of 326 anglers. This whole week was an amazing time. I was honored to be able to fish in the National Championship and to even be on the playing field with the sports best! I learned a lot and gained valuable deep water fishing experience! I also would like to say thank you to all the companies that support me. 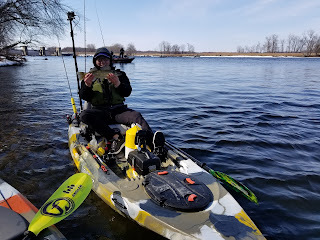 Kistler Rods helped me feel those light bites in white cap conditions. 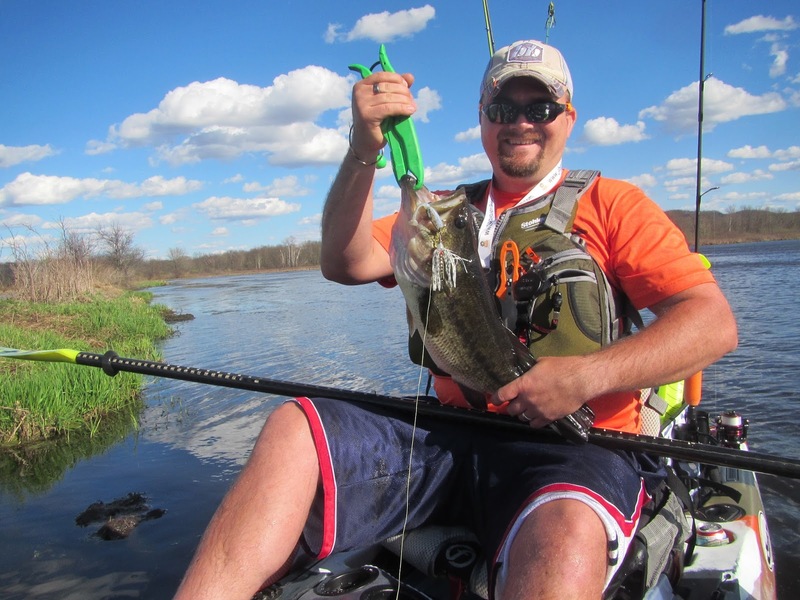 Pline's 17lb tactical fluorocarbon helped me keep those fish pinned in deep water. My Smith Optics helped keep my eyes protected and helped me see the fish before they saw me when fishing shallow! Pesticides, roadways, pastures, etc. Though inevitable, runoff is a reality in our water ways. I'm not a "hippie" or "tree hugger". I drive a Jeep, love my guns (have a CCW and carry one in my kayak), and do not have a compost pile in my yard. But I'm a realist that loves the outdoors. Runoff happens in our society, a fact of the evolution of society. 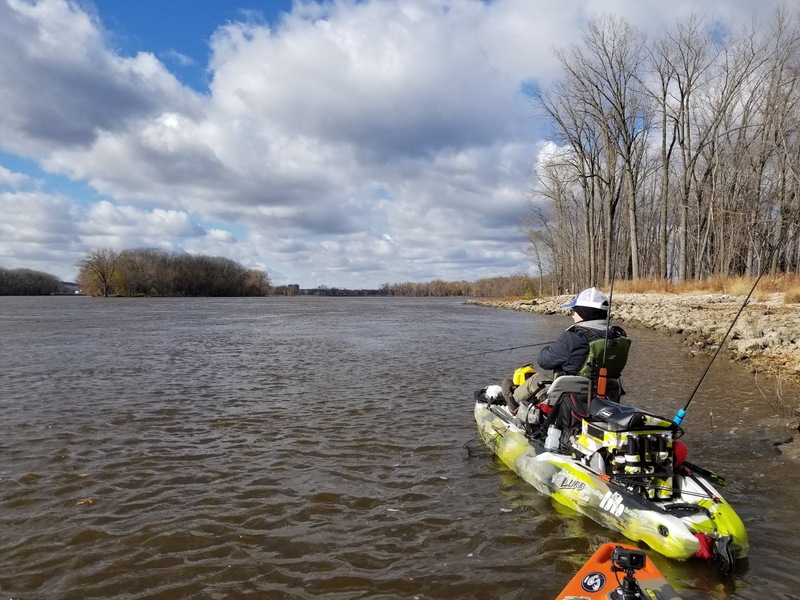 As an avid outdoorsman, professional kayak fisherman (who fishes tournaments, owns an outfitting company, is a guide, and a mentor to up-and-coming kayak anglers), I understand the importance of preserving our waterways for future generations. Let alone environmental issues, there are enough waterway issues to make your head spin. Where do we start? We start with responsibility and mitigation. This includes picking up your own garbage, picking up garbage of others you encounter on the water, and respecting the body of water you are on. The last item has become a concerning issue in my hometown of Richland Center, Wisconsin where jet skiers have begun frequenting this narrow river. I now reside in Spring Valley, WI (between Menomonie and River Falls) where we are blessed with similar amazing river systems which frequent numerous tourists every year. 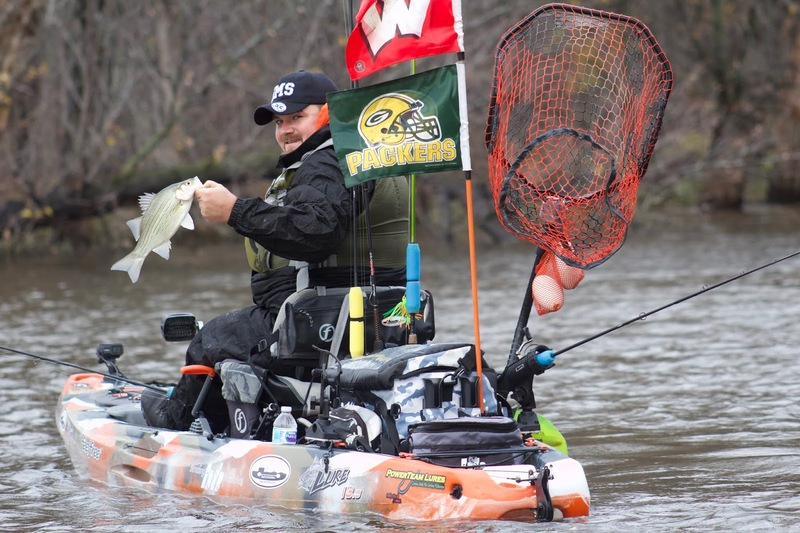 A motorized pleasure craft on the Red Cedar River or Kinnickinnic river would be obscene (though motorized fishing boats frequent the river without issue). These narrow rivers are a haven for numerous wildlife, one of which is trout. Trout, a draw for tourism, are sensitive to environmental changes. 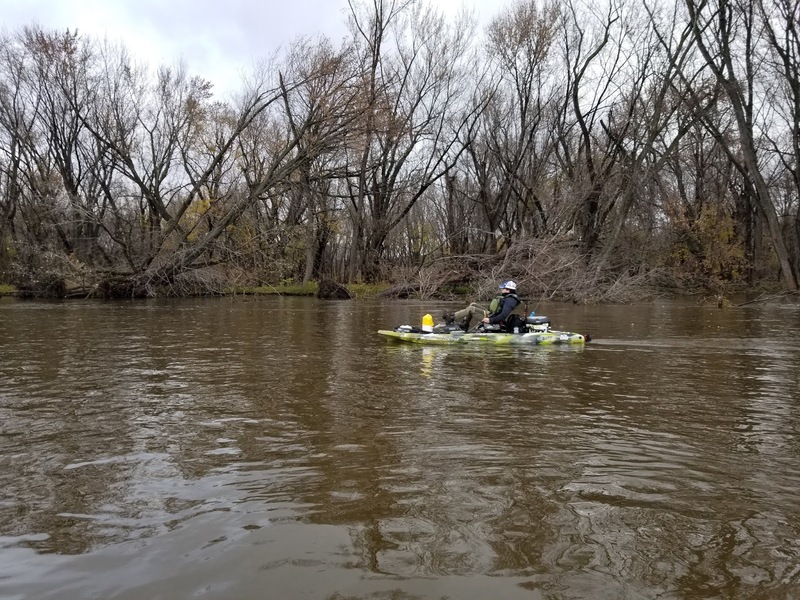 A group of dedicated people in the Richland Center, WI area have gone to great lengths to fix and maintain this habitat which is now in danger of getting reversed. When I tell people I kayak and grew up in Richland Center, the instantly say, "I've paddled the Kickapoo! I loved it!". I agree, the Kickapoo provides an amazing waterway for anglers, paddlers, swimmers, campers, etc. But I never hear anything about the Pine. 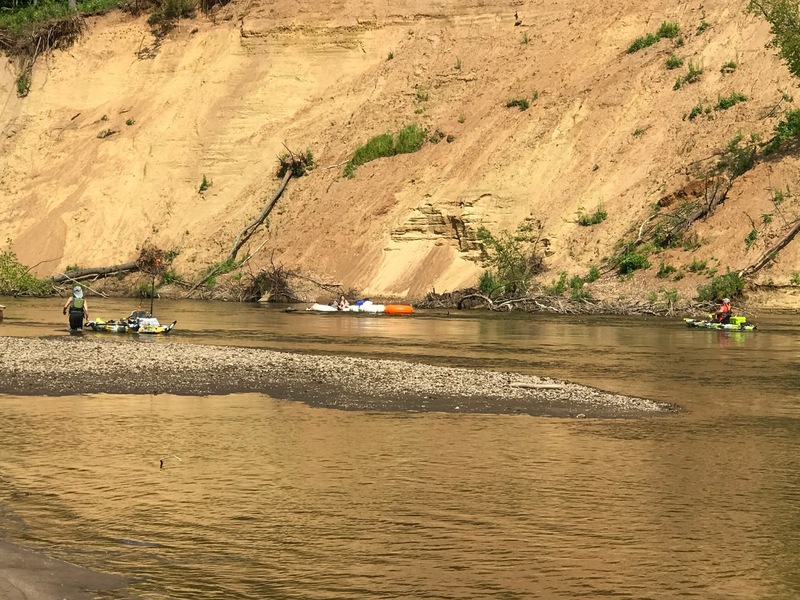 They were finally starting to move the Pine in the right direction to get "on the map" as a paddling destination, jet skiers are now putting that at risk. My parents own a large motorized boat, they used to have jet skis which I thoroughly enjoyed on numerous occasions. But there is a place for pleasure craft. That is on larger bodies of waters capable of handling the wakes and traffic. Running a jet ski (or any motorized pleasure craft creating a wake) on a river as narrow as the Pine is reckless and irresponsible. Should someone encounter a canoe, kayak, tube, or any other watercraft around a blind corner there is a high risk for collision. This is why any fishing boats I encounter on the Red Cedar River are motoring no-wake. Peaceful coexistence. Let alone the human safety issues, there is an ecological impact having pleasure craft on this small river. I frequently fish the sloughs of the Mississippi in Nelson, WI. This beautiful area is covered in countless acres of water, beautiful bluffs, and amazing wildlife. It also houses an amazing fishery. You'll find this area filled with a variety of craft: canoe, kayaks, jon boats, fishing boats, large bass boats, air boats, and even hover craft. But even in this large area, the narrow spots of the sloughs are marked no-wake because of the ecological impact of wakes and fast-moving motorized craft. The motorized craft in shallow, narrow areas stir up the dirt and cause major erosion in the channel. The wake causes erosion on the shore. 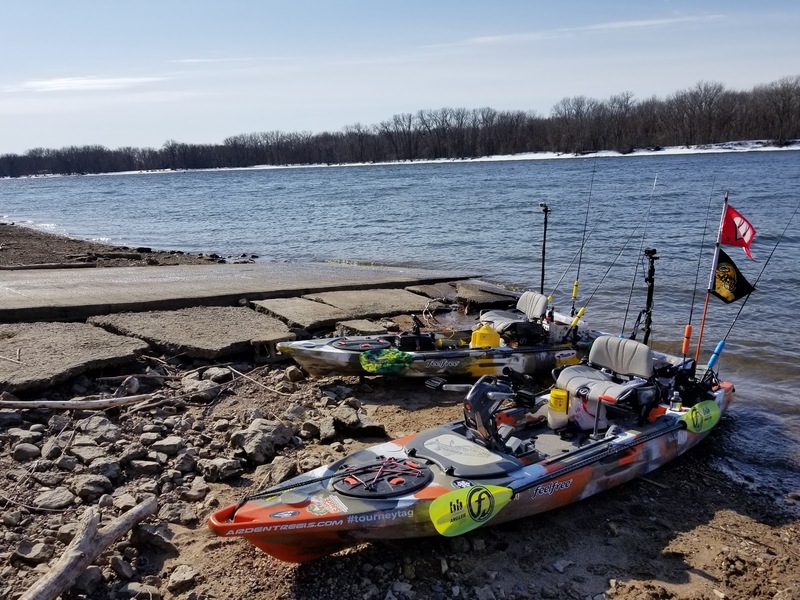 Yes, the water naturally erodes the shoreline and channels, but motorized craft exponentially speed this process if proper caution is not given to the area. Let alone the safety issues for the motorized craft running these areas at high speed. This can cause significant damage to the watercraft and/or injury/death to those on it. This is not about spoiling someone's fun. Yes, I would love to run a jet ski on the Pine. I thought it was funny the first time I heard of it happening (assuming it was an early season one-time deal to get things ready for the season). But to allow this to continue is irresponsible. 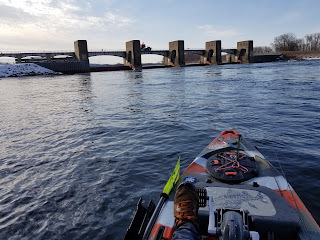 Running any motorized craft on that river, other than at no-wake speeds, is like allowing ATV traffic on the Elroy-Sparta bike trails year-round. 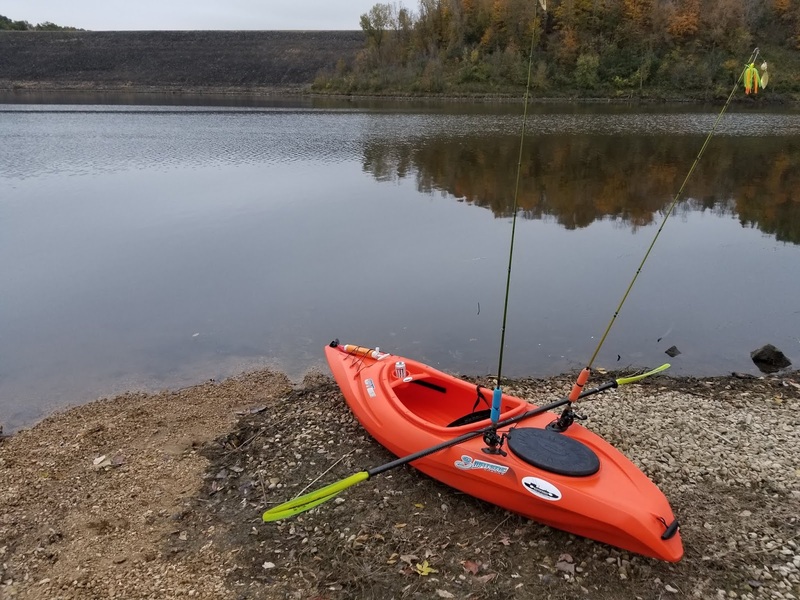 As an avid kayak angler and EMT trainee, I am deeply concerned with this activity which can either be made no-wake or taken to a larger body of water. Watercraft do not have brakes and human-powered craft have limited maneuverability. I don't want to hear of ANYONE (kayaker, canoer, tuber, boater, jet skier) being injured or killed because of these activities. 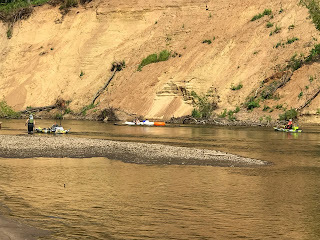 Thus, as a friend, family member, and native of Richland Center, I ask those partaking in the activity make it no-wake or move to larger water. 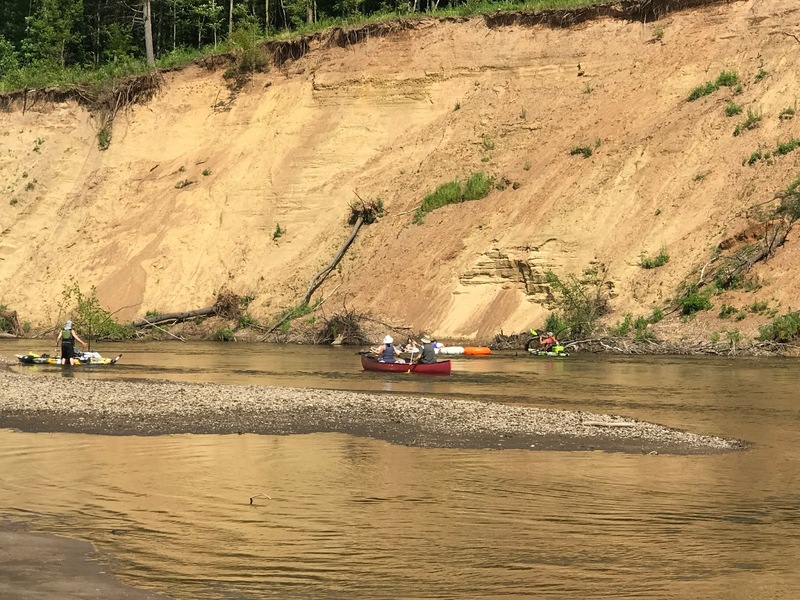 I ask paddlers to stay off the river until they do. And I call on local DNR and law enforcement to do what is right and make this a no-wake area. I can't imagine responding to an EMS call involving a collision on that small river. And I can't imagine telling a family member they lost a loved one enjoying one of their favorite pass-times whether it be boating, kayaking, jet skiing, canoeing, tubing, or floating down a river with a cooler full of beer in arm floaties. My friends, family, and community members in the Richland Center, WI area, please be safe. I know and love some of the people partaking in the jet ski activities. I beg you, please move on from this.